A faculty and staff recognition program at The University of Toledo Medical Center is off to a strong start as a dozen people have received the honor. The iCare Shining Star Program, which honored its first award recipients in November, acknowledges people for demonstrating the iCare standards of communication, access, respect and excellence. The recipients are those who are employed at UTMC or UT physicians and are nominated by faculty, staff, patients and students. Each “Shining Star” receives a trophy, reserved parking space for the month, and a gift card. Communication — Lori Oehlers, a radiology technician, was recognized for her positive attitude and treating patients like family members. Her friendliness was evidenced when she went out of her way to help a patient who fell and fractured a hip in the cafeteria. Access — Tom Curtis, a biomedical equipment technician, was given the award for his exemplary patient safety service, reliability, and quick wit in minimizing equipment down time and patient wait times. Respect — Dr. Douglas Federman, associate professor of family medicine, was honored for not only his genuine caring and courteous nature toward all patients, but also the utmost respect he has for them. Excellence — Dr. Daniel Rapport, associate professor of psychiatry, was recognized for his exemplary work and intelligence in every aspect of his work as well as his caring, attentive and insightful manner when working with patients. Communication — Mandy Wott, a postoperative nurse, was honored for her caring nature for patients and their family members. Not only did she help a family understand in a postoperative situation, she also played an instrumental role in a patient’s survival after experiencing serious complications. Access — Megan Ewing, an operating room nurse, was recognized for her enthusiasm in the nursing profession and the many hours she gives to projects, including patient education videos and tracking customer satisfaction scores. She inspires others to do their best. Respect: Dr. Jan Brown, an ER resident, was honored for his respect and promptness when it comes to caring for patients. Catherine Sutton, technical typist in the Emergency Department, said he is a perfect example of what it means to be a great doctor. Excellence — Lindsay Ash, a licensed social worker, was awarded for her dedication and efforts with the Humane Society and Planned Pethood to provide comfort and alleviate a burden to a family during a difficult time by caring for more than two dozen cats at the patient’s home. Communication — Natalie Tomasi, a neurosurgery clinic scheduler, was recognized for her sensitivity to patient needs and ensuring patients and family members understand instructions. She also went out of her way to notify and coordinate special transportation for an elderly patient when there was a scheduling change. Access — Dr. Cyrus Chan in the Department of Surgery was honored for his excellent follow through and positive attitude with patients. He consistently makes sure all patient needs are met. Respect — Paul Mazur, a cath lab nurse, was awarded for his treatment of patients with respect and dignity at all times. Mazur is described as the model of efficiency, and many patients request his services. Excellence — Linda Salazar, a member of Environmental Services, was recognized for her trustworthy nature and attention to detail. Dr. Marijo Tamburrino, professor and chair of psychiatry, said she trusts her with patient confidentiality and that Salazar goes beyond her daily duties, cleaning waiting room chairs and office doors. If you are interested in nominating a UTMC staff member or UT Physician, nomination forms are available online at utmc.utoledo.edu/icare and at the information desk in UTMC’s main lobby and waiting areas throughout the hospital. Completed forms can be dropped off at the information desk in the main lobby or in any suggestion box on Health Science Campus, or sent to mail stop 1168. OnStar, a comprehensive in-vehicle safety, security and communication service, is calling on students at The University of Toledo to partake in the OnStar Student Developer Challenge. The Grand Prize, also known as the Developer Dream Package valued at $10,000, includes an iPad, MacBook Pro and more. Six semifinalists will win an all-expenses paid VIP trip to the O’Reilly’s Where 2.0 Conference in Santa Clara, Calif., to present their applications to a panel of judges. Students can enter as an individual or as a team of no more than five members. “This is another great opportunity for our students to prove to the world and more importantly to themselves that important and lasting contributions to society can originate right here through their innovation and intellect,” said Dr. Nagi Naganathan, dean of the College of Engineering. Naganathan is expecting at least 15 to 20 UT engineering students to participate in the challenge. An kick-off workshop will take place from 4 to 6 p.m. Monday, Jan. 31, in the Nitschke Hall SSOE Seminar Room. At the workshop, students will learn additional information for the challenge and will have the opportunity to work hands-on with voice app experts from OnStar and QuickFuse. Food, drinks and prizes will be provided for those who attend. Seven former student-athletes will be inducted into The University of Toledo Varsity ‘T’ Hall of Fame Friday, Feb. 11, at the Pinnacle in Maumee. Social hour for the event will begin at 6 p.m., and dinner will follow at 7 p.m.
Tickets for the Varsity ‘T’ Hall of Fame induction dinner are $40 and can be purchased by calling the Athletic Development Office at 419.530.2510. Christin Chadwick, Softball (1989-92). She was a two-time All-Mid-American Conference pitcher who also earned All-Mideast Region honors in 1992. As a junior in 1991, she earned second-team All-MAC honors, winning 22 games in 32 starts and pitching a school-record 256 innings. In 1992, she received a first-team All-MAC selection as she posted a 25-10 record and a 1.13 ERA on the mound to lead UT to its third MAC title and its second NCAA Tournament appearance. An outstanding student, Chadwick earned second-team Academic All-America honors in 1991 and 1992, and Academic All-MAC in 1990 and 1991. She was a member of the 1989 and 1992 MAC Championship teams, and the seventh-place College World Series team in 1989. On UT’s career list, she ranks first in wins (72), second in winning percentage (65.5), second in game appearances (131), third in ERA (1.38), third in innings pitched (773), fourth in strikeouts (399) and fifth in starts (91). On UT’s season list, she ranks second and third in wins (25 in 1992, 22 in 1991); second and third in winning percentage (8-3 in 1989 and 25-10 in 1992); second in games pitched (41 in 1991); and first in innings pitched (256 in 1991). In the MAC record book, Chadwick ranks third in career wins, fifth in career innings pitched and ninth in career shutouts. Her 25 wins in 1992 is the eighth-largest total in MAC history. Shauna Cottrell, Women’s Soccer (1996-2000). She was a two-time All-MAC honoree, making second-team All-MAC as a junior in 1997 and first-team All-MAC as a senior in 1998. As a senior, she also made third-team Great Lakes Region and All-Ohio first-team. Her team honors include Team MVP and Offensive MVP in 1998, Defensive MVP in 1997 and Most Improved Player in 1997. She tied for the team lead with seven goals in 1998, while leading the team in shots on goal. After graduation, Cottrell played soccer in Iceland for one summer and later became an assistant coach at Dayton, helping the Flyers advance to the Sweet 16. Since then, Cottrell has lived and worked as a teacher in Sweden, her native Canada and Singapore, where she lives today. David Keller, Wrestling (1966-69). Captain of the 1969 MAC Championship team, Keller is the only Rocket to be named to the National Wrestling Coaches East-West All-Star meet, where he defeated 1972 Olympian Sergio Gonzales. Keller was an NCAA semifinalist and an NCAA Coaches Association All-American in 1968 (115 pounds) while finishing fourth in the 1968 Final National Olympic tryout in Greco-Roman (114.5 pounds). He was individual MAC Tournament champion as a senior in 1969 at 123 pounds, fourth as a sophomore and runner-up as a freshman. He was the National YMCA Champion in 1966 and 1967, the Ohio AAU Greco-Roman Champion in 1964-66 and 1968, and the Michigan AAU Greco-Roman Champion in 1966. He is the only wrestler in school history to win the Midlands Open Tournament. Lance Moore, Football (2001-04). Although he was a starter for only two seasons, Moore broke just about every receiving mark in the UT record books. He enjoyed terrific junior and senior seasons, earning first-team All-MAC honors both years, and earning honorable mention All-American honors by SportsIllustrated.com as a senior. As a junior, Moore shattered the UT record for receptions with 103, and also set marks for receiving yards (1,194) and touchdown receptions (9). His biggest game came in a 35-31 win over No. 9 Pittsburgh in which he set the school mark (since broken by his brother, Nick) with 15 receptions, including the game-winner in the corner of the end zone in the waning moments of the contest. As a senior, Moore caught 90 passes for 1,189 yards, setting the school mark for TD receptions with 15, including three scores in Toledo’s 35-27 win over Miami in the 2004 MAC Championship Game. He also caught six passes as a freshman and 23 as a sophomore. Moore also was an excellent student, earning Academic All-America honors as a senior in 2004. After graduation, he was signed as a free agent by the Cleveland Browns, but eventually caught on with the New Orleans Saints, where he had a breakout season in 2008, racking up 79 receptions for 928 yards and 10 touchdowns. His playing time was limited due to injuries in 2009, but he returned to the lineup in time to play in the Saints’ Super Bowl victory, making one of the great plays in Super Bowl history to score on a two-point conversion. Greg Morton, Men’s Tennis/Men’s Basketball (1967-71). He was a three-time MAC champion, winning the league title at No. 4 singles as a sophomore in 1969, at No. 2 singles as a junior in 1970, and No. 1 singles as a senior in 1971. The Rockets won the MAC Championship title in all three of those seasons. In the 1971 season, Morton became the first Rocket tennis player to go undefeated in singles play, besting players from major conferences, including the Big Eight and the Big Ten. In 1970, Morton was a singles finalist at the Black National Tennis Championship in St. Louis. Morton also played basketball at UT, earning a letter as a walk-on in the 1970-71 season. He graduated with a degree in elementary education and went on to earn his master’s degree from Cleveland State University. Morton and his wife, Beverly, are lifelong teachers who both retired last June. Clarence Russell, Men’s Track and Field (1993-97). He was a six-time MAC champion in the long jump and triple jump, and set league records in indoor long jump and indoor triple jump. He earned All-America honors in the long jump in 1997, and was the UT record holder in the long jump and triple jump. He won MAC titles in the long jump in 1996 and 1997 in both the indoor and outdoor events, and the indoor triple jump in 1997. He was a member of Team USA for Pan Am Games in 1993. Paul Sehzue, Men’s Track and Field/Football (1996-2000). He was a three-time MAC Champion and multi-record holder who qualified for the 2000 Olympics in Sydney for Liberia, the home country of his father. He also was on the UT football team, playing safety and special teams in 21 games in 1997 and 1998. Sehzue was the Indoor MAC Champion in the 60-meter hurdles (1999) and 55-meter hurdles (1998), as well as the Outdoor MAC Champion in the 110-meter high hurdles (1998). He also was a two-time All-Ohio Champion in the 55-meter hurdles (1998, 1999). While at Toledo, Sehzue set school records in the 55-meter hurdles (7.37), 60-meter hurdles (7.81) and 110-meter high hurdles (13.85). At the 2000 Olympics, Sehzue advanced to the quarterfinals in the 110-meter hurdles. Prior to his Olympic experience, Sehzue competed in the 1999 World Championships in Seville, Spain, also representing Liberia and competing in the 110-meter hurdles and 4×100-meter relays. He graduated from Toledo with a bachelor’s degree in individualized studies in 2002. He is pursuing his master’s degrees from Ohio University in education with a coaching emphasis and from Toledo in liberal studies. He is in his first year as a graduate assistant coach for the women’s track and field team at UT. Prior to returning to his alma mater, Sehzue served as the athletic director and head football/track and field coach at KIPP Houston High School in Houston from 2008 to 2010. Before that, he was the assistant football/assistant track and field coach at Pullman High School in Pullman, Wash., for two years. From 2004 to 2006, Sehzue served as the assistant football and assistant track and field coach at Gulf Coast High School in Naples, Fla. Sehzue also served as an assistant track and field coach at Toledo from 2002 to 2004 following his four years as a student-athlete. He returned to UT in fall 2010 as an assistant track coach. Two other awards will be presented during the banquet. The Distinguished Service Award will be given posthumously to former Head Athletic Trainer Dave Huffstetler and Bob Standriff, a longtime UT athletics supporter. The University of Toledo is looking for ways to restore and protect the Great Lakes, and the Department of Geography and Planning received a grant to do the research that will help. 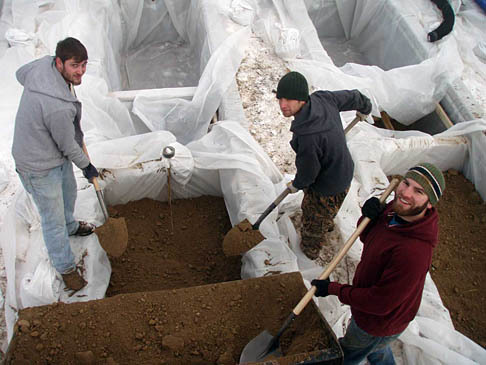 Paul Lenos, left, a student majoring in environmental sciences, Scott Denham, center, a student at Youngstown State University who will attend graduate school at UT this fall, and Robert Hanlon, a student majoring in engineering and environmental sciences, prepared a mesocosm — an experimental soil enclosure to simulate an agricultural field to monitor runoff at Stranahan Arboretum. The University was awarded a $550,000 grant from the Environmental Protection Agency to develop ways to reduce the impact of sewage sludge on surface water in the Great Lakes. Various UT departments have been studying for years the impact biosolids have on Lake Erie, and this grant will help to continue that work. The research funding through this grant will look at the extent to which biosolids applied to farm fields have an impact on the lake, and what can be done to decrease this impact while restoring natural areas and protecting future generations. “The artificial drainage used on farm fields may allow rain to carry fertilizer and other contaminants into drainage ditches that end up in the receiving water bodies. These contaminants really should stay on the fields and away from humans,” said Dr. Kevin Czajkowski, professor of geography and planning, and lead investigator on the project. Biosolids are great for agriculture because they can provide nutrients and structure to farm soils. The biosolids used in this region come from wastewater treatment plants. While most bacteria are killed during the water treatment process, in some cases, pathogenic organisms, nutrients and personal care products aren’t broken down and can make it onto farm fields through the fertilizer, according to Dr. Daryl Dwyer, professor of environmental sciences, who also is involved in the research. Therefore, one goal of the research is to keep nutrients on the fields and reduce the amount of contaminants entering Lake Erie. One way to do this is by restoring wetlands in northwest Ohio, a strategy being pursued by University researchers for drainage ditches near Lake Erie. The project also is good for the economy because it ensures the lake will continue to be safe for recreation and fishing, he added. The updated anatomy lab at The University of Toledo College of Medicine and Life Sciences is brighter with more equipment to better educate medical students. The recent renovation project not only upgraded the look of the 4,000-square-foot laboratory with new lights, new ceiling and an improved ventilation system, but the addition of whiteboards and more wall-mounted computers are designed to improve instruction. The College of Medicine and Life Sciences Anatomy Lab will be dedicated at 12:30 p.m. Thursday, Jan. 27, with the unveiling of a new sign and tours of the newly upgraded facility. The lab is located in the basement of the Block Health Science Building. The anatomy lab trains 175 medical students each year, in addition to 35 physician assistant students, about half the class of fourth-year medical students updating their skills before residencies, and medical residents studying advanced anatomy for their specialties. More than 1,000 high school students also tour the lab each year through the Student-to-Student Program. The 50 cadavers in the anatomy lab, which most medical students consider their first patient, provide needed training in knowledge, skills and professionalism that goes above and beyond lectures and textbooks. For more information on the Anatomical Donation Program, click here. This week, wallet-sized cards designed to help members of the campus community function during crisis situations will be distributed throughout Health Science and Main campuses. The goal, according to Lawrence J. Burns, vice president for external affairs and interim vice president for equity and diversity, is to offer instruction during a time when calm may be lost. The cards, similar to those containing athletic schedules, will be available at several key locations on both campuses, including Skyview Food Court on Health Science Campus and the Student Recreation Center, Rocket Hall and the Student Union on Main Campus. Departments on Health Science Campus will receive them through interoffice mail. In addition, cards will be distributed throughout residence halls and during various student meetings. 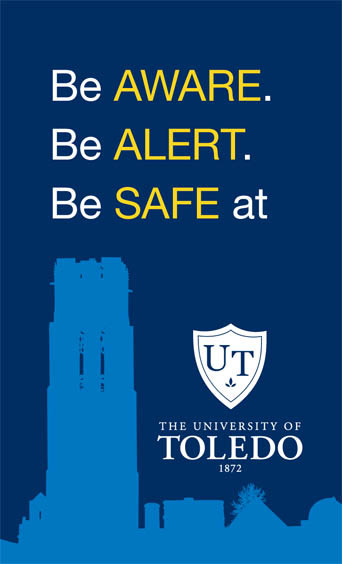 UT Police contributed the information, which includes action plans during scenarios that include tornado warning, structure fire and violence, including gunfire on campus. Emergency telephone numbers are included. The cards will be re-distributed to the campus community each year and included in Rocket Launch orientation materials for incoming students. “We want every member of the UT community — faculty, staff and students — to have access to this important tool,” Burns said, noting those who don’t receive one through planned distribution may contact Lindsay Ackerman in the Office of External Affairs at 419.530.1273. 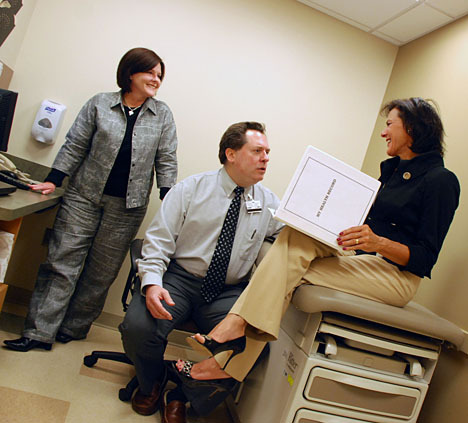 Increased patient-centeredness and a more focused attention on providing excellent service is the heart of a new plan aimed at improving patient satisfaction ratings at The University of Toledo Medical Center. Dr. Larry Elmer, neurology professor and medical director of the Center for Neurological Disorders, and Debra O'Connell, neurology research assistant, talked with a patient about her medical history. The plan, which was unveiled at an operations leadership team meeting Jan. 19, looks to boost UTMC’s patient satisfaction scores by 15 percent over the next 11 months. Dr. Scott Scarborough, interim vice president and executive director of UTMC, said increasing the patient satisfaction ratings is one of the last hurdles the organization must vault in order to become a world-class health-care provider. To meet this goal, the plan, which was presented by UTMC Director of Patient Satisfaction Ioan Duca, calls for the creation of seven specialized service excellence teams, each co-chaired by staff and faculty members. • Measurement team led by Jovonne Foster and Cindy O’Connell. A few of the goals the teams will look to accomplish are establishing hourly patient rounding with a purpose in all clinical departments; deploying universal staff scripts to provide patients with appropriate and consistent messaging; hardwiring new standards of behavior, and identifying and removing employee irritants; creating a daily communication huddle in each department; and reducing the patient wait time significantly. The leaders from each team will form the service excellence steering committee, which will be led by Duca, Scarborough and Marge McFadden, hospital administrator. Duca and Scarborough both see this plan as the necessary next step in cementing UTMC’s position as a world-class hospital. University of Toledo student retention increased sharply as the institution continued its efforts to increase academic standards and require additional academic preparedness from incoming students. “As we prepared for recruitment last fall, UT’s Board of Trustees and President Lloyd Jacobs directed us to place greater emphasis on the recruiting and retaining of students with a higher level of academic preparedness, and we’re right where we expected to be,” said Lawrence J. Burns, vice president for external affairs and interim vice president for equity and diversity, who oversees UT enrollment efforts. As of Jan. 24’s 15-day census, UT enrolled 21,108 students, a 2.3 percent drop from this time last year. The University’s full-time equivalency (FTE) — the figure used to determine state subsidy — is 17,798. FTE is calculated by the total number of course credit hours taken by students divided by 15 and often conveys a more accurate representation of the way enrollment affects an institution’s finances. Burns said a strategy including higher admission standards in several academic colleges, deferral of several hundred underprepared students in the fall semester, and focused scholarship programs like the Blue & Gold Scholar Award already had shown increased academic achievement among UT students. Kevin Kucera, associate vice president for enrollment services, pointed to a 7 percentage point increase in retention rates for direct from high school students from last fall to the current semester as compared to last year. The return rate jumped 14 points for Blue & Gold Scholars from fall to the current semester up to 92 percent from last year. “We’re keeping a far greater percentage of the students we recruited this fall and that is exactly because we’re recruiting students who are more academically prepared,” Kucera said, noting that the college grade point averages of Blue & Gold Scholars jumped nearly 0.6 points from Fall 2009 to Fall 2010. Spring 2011 also will mark the final census report for several colleges that were created or merged following the reorganization of the academic enterprise late last year. Jacobs also pointed out that the newly formed colleges of Innovative Learning and Adult and Lifelong Learning will be leaders in helping colleges, schools and departments retain the students that select to pursue their degrees at UT. Below is a letter regarding the recent computer software error at the University that resulted in a backlog of food service credit card payments made on Main and Health Science campuses. It was sent by e-mail to students, faculty and staff Monday, Jan. 24. As you may be aware, a computer glitch identified last week has caused some members of The University of Toledo community to see a sudden backlog of charges to their bank accounts. We sincerely apologize for any inconvenience this has caused and are working diligently to resolve the situation so that no harm comes to those impacted. A team has been dispatched to analyze individual situations on a case-by-case basis to ensure the accuracy of charges. In short, the glitch caused our systems to hold up a large number of transactions dating back to Sept. 28, 2010. Once the glitch was discovered, the transactions were fully processed Jan. 10. During this period, charges would appear as “pending” on the customer’s account for a time, yet they were never completed. While we have no reason to believe there was any duplication of charges, we will work to reconcile the transactions with the records and financial institutions of anyone who believes they were negatively impacted. If you recently incurred charges for purchases made between Sept. 28, 2010, and Jan. 9, 2011, and have concerns, you may visit https://entapps00.utoledo.edu/diningcharges/ for additional information and potential remedies for overdraft fees should you have incurred them. The website will provide you with instructions on how to submit a request for assistance electronically to auxiliaryservices@utoledo.edu. UT has, and will continue to, reach out to our customers’ financial institutions in an effort to get overdraft fees waived. You may also submit inquires by calling 419.530.1640; however, submitting your information through the website will help expedite the process. Thank you in advance for showing understanding in this matter. Please know that we are working hard to correct this unfortunate situation.